Patient Care Funds give residents a say in how best to provide for our patients. 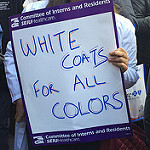 CIR residents recognize that advocating for patients also means ensuring there is adequate funding to provide cutting-edge medical technology, conduct research, and implement innovations that help save the lives of patients who would otherwise fall through the cracks. Cover patient safety quality improvement projects. To find out if your hospital has negotiated this benefit, visit your hospital page here. If you are NOT a CIR member, a letter of support from a CIR member is required for your application to be reviewed. The letter should briefly explain how the CIR member believes the funding of your request will improve patient care. This grant is designed to provide funds to projects that will lead to improvement in quality of patient care at Jackson Hospital. Click here to apply. At UNM a resident-led committee manages an annual application process to allocate funding throughout the year. Previous projects have included an Accuvein vein finder for the NICU, a C-MAC for intubations in the ED, and therapeutic toys for the child psychiatry clinics. Frequently Asked Questions – Coming soon!